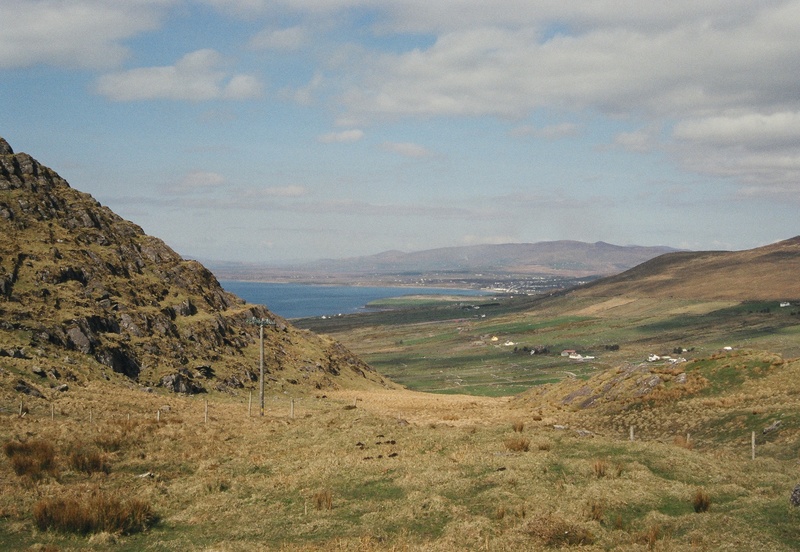 Have you ever been to Ireland? I’ve been there twice and look forward to returning for a third visit. The countryside is breathtakingly beautiful. 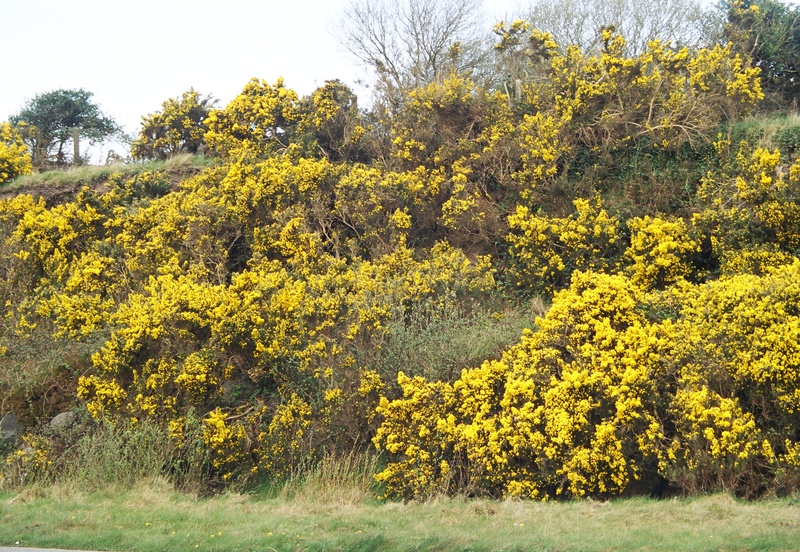 If you are fortunate enough to tour Kerry on a sunny day when the gorse is in bloom, you will see the hillsides glowing with gold. It reminds me of my native West Virginia when the goldenrod is in bloom. Who doesn’t love Aran sweaters? A couple of years ago I joined an Aran sweater KAL (knit-along) to make a top-down Aran sweater. It is called the FLAK (Follow the Leader Aran Knit-along) and it was led by the master of top-down cable knitting, Janet Szabo at Big Sky Knitting. I made my FLAK as a jumper (pullover) in Knit Picks Wool of the Andes in the color Rain. I love this sweater and wear it often. It’s roomy and warm and great to wear out walking on a chilly day. KALs are very seductive. But I have vowed not to join any KALs in 2008. To begin with, I still haven’t finished Gjende from the 2007 Dale of Norway KAL. It’s almost finished, mind you. I just have a little bit of the sleeves to finish, then sew the shoulders, knit the neckband, then steel myself to cut the steeks and sew in the sleeves. But there sits Gjende in my knitting bag, forlorn and lonely, waiting to be finished. 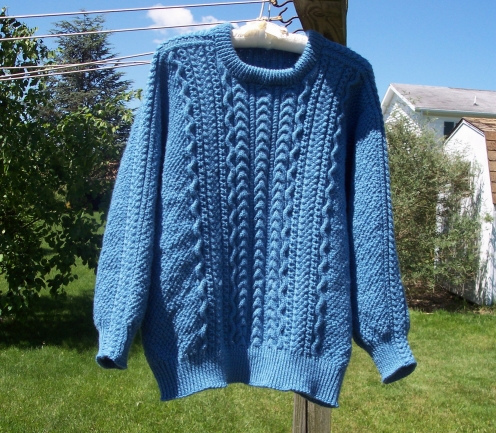 Then there is Marianne Kinzel’s Balmoral, a KAL from 3 years ago. I started it in #60 cotton thread and got so annoyed at trying to push the stitches over the joins of my Susan Bates circular needles that I shoved it in a bag where it has marinated for a couple of years. I recently bought some Knit Picks circulars to replace the Susan Bates circulars. KP circs have such a nice join and I’m hopeful the stitches will move more smoothly from the cable to the needle on the KPs than they do on the SBs. Who knows when I will get around to it? Some knitters talk about going on yarn diets. I’m on a KAL diet.